Beautiful depiction of a truly latest situation outside in the market. Who-is-where or who-is-who vis-a-vis technology and latest gadgets. The clarity and details in the cartoon are simply superb! This is very good cartoon. It is clearly depicting now a days mobile usage. This is an excellent cartoon showing the mobile evolution. From being a helpful invention to becoming an impediment! It's true that these days the service providers (Airtel, hutch, etc) wait for a chance to make us dance. The picture is very apt. The concept is well known to everybody but the way it is depicted is outstanding. EXCELLENT,BAARI LAYKUNDU.....ERA OF MOBILES AND MOBILE MANIA IS SUPERBLY DEPICTED.BRIGHT COLOUR COMBI. 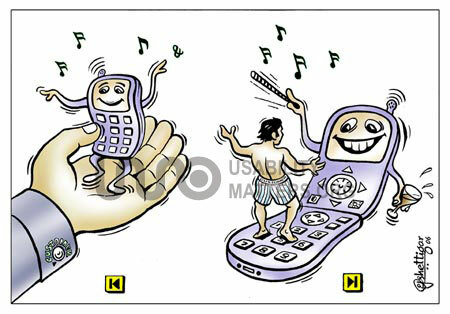 Excellent cartoon, once man used to play with mobile... now it became the otherway around.. Mobile must be in our control but shouldn't be the other way round. This was shown brilliantly in your cartoon. Excellent Yogish. "Karlo Mobile Mutti mein - Ever" 'magar' "Apan Mobile ki Mutti mein - Never". Excellent depiction of the current situation of how the mobiles phones are now ruling the world.